Ahmed Dawabsheh's parents and one-year-old brother Ali were killed as a result of the blaze started by Israeli settlers. The Israeli hospital in which Ahmed Dawabsheh is being treated has demanded the Palestinian Authority’s Ministry of Health pay 259,643 shekels ($67,000) to cover the cost of his treatment. In a Price Tag attack, a group of settlers burned down Ahmed’s family home in the village of Douma, near the city of Nablus, on 31 July. The four-year-old’s parents and one-year-old brother Ali were killed as a result of the blaze. In a press statement issued yesterday, the ministry said that on 25 October Tel Hashomer Hospital asked the ministry to cover the cost of Ahmed’s treatment; more than a quarter of a million shekels to date. The ministry said the hospital had previously demanded 216,754 shekels ($56,000) to cover the cost of Ahmed’s mother Reham’s treatment prior to her death. 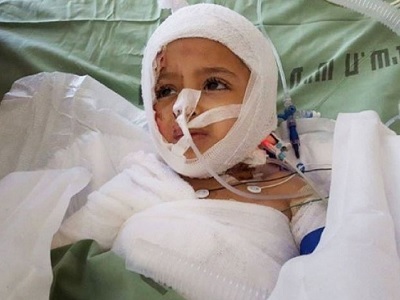 Israeli Coordinator of Government Activities in the Territories, Yoav Mordechai, had previously said that Israel would pay for Ahmed’s medical costs.